The development of the Judicial Branch budget involves a lengthy process lasting almost a full year from start to finish. The process begins, internally, with courts and non-judicial agencies submitting their requests to the Chief Justice for mission critical operating and capital needs each August. Operating requests include staffing and all other types of requests, except capital or building construction and maintenance costs. The budget requests are thoroughly vetted by the court administrators and the chief judges. Development of the request requires the input and cooperation of each of the courts as individual court requests are pared and branch-wide priorities are developed to ensure that the request focuses only on the most crucial items. Once the priorities are established, the budget request is submitted to the Office of Management and Budget (OMB) in mid-October, with the public hearing on that request with OMB usually occurring in November. The Governor’s recommended budget, including the Governor’s recommendations regarding the Judicial Branch’s budget, is introduced as legislation in January. As a separate Branch of Government, the Judicial Branch has the option of requesting additional budget items beyond those recommended by the Governor, at its hearing before the Joint Finance Committee in the spring. The final budget is generally adopted in June. Providing electronic court reporters to enhance security by permitting judicial assistants to focus on security, and to improve existing ability to meet public need and the requirement of maintaining the court record. Funding minor capital improvements including those needed for code compliance in the Justice of the Peace Court. 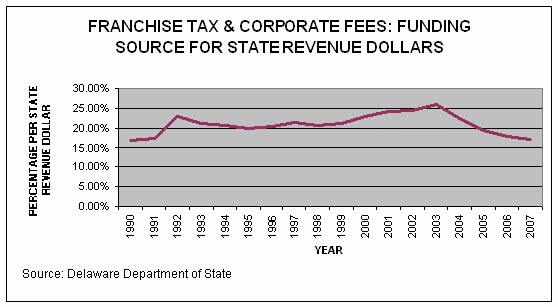 The Delaware Judiciary’s national and international reputation plays a key role in attracting businesses and contributing to the State’s resources through sources such as the franchise tax and corporate fees, which together account for close to 20% of State revenues. The Judiciary receives less than 3% of State appropriations.